First off, I'd like to Thank those of you who showed great feedback on my last mommy post! 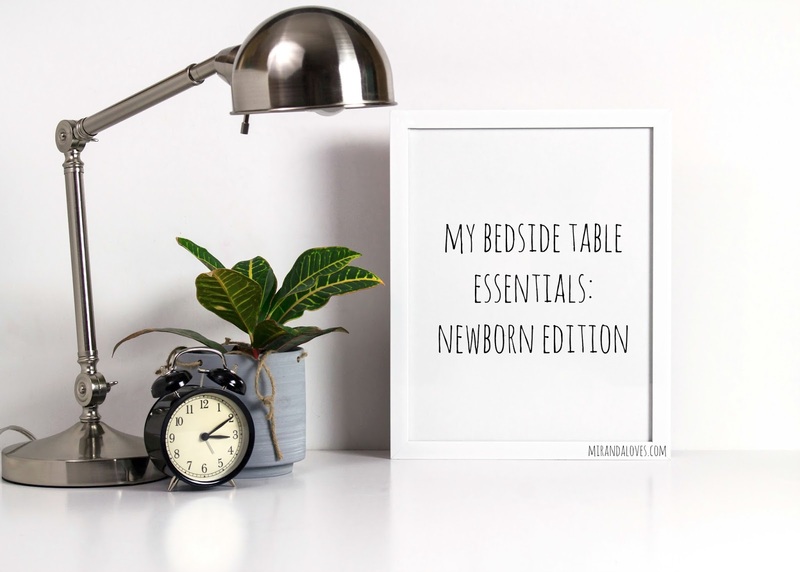 It's great to know that my personal experiences can help you guys, regardless the number of people :) This post is going to focus on what I found to be helpful to keep in the bedroom, especially in the first few weeks of bringing baby home. 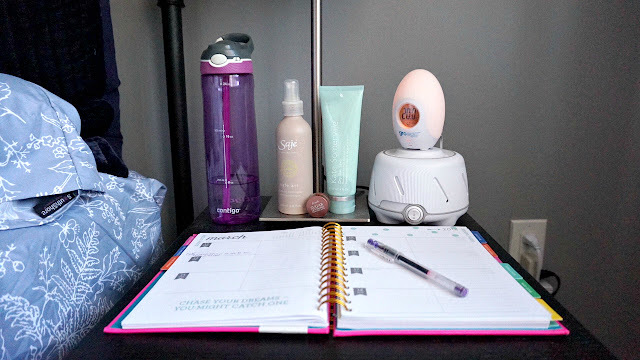 I really liked having a room spray in the room that I can use on occasion if required to just set the room for a more cleansed and relaxed state - the Saje one really helped with that. I typically spray it in the room before I leave it for a few hours with baby when we go downstairs and come back to the room just feeling a bit more refreshed. Being that we can't open windows in the winter, this just did the trick. As a mom, you will lose track of the number of times you are constantly washing your hands - before and after feeding, before and after diaper changes and so forth. Being that my hands are eczema prone, my hands really started feeling quite irritated within a few days. 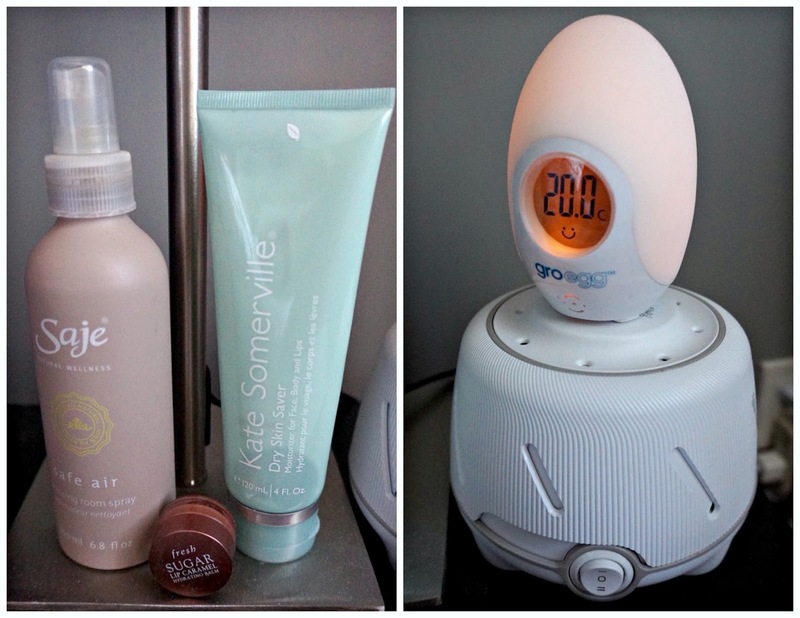 It is a good practice to keep a moisturizer (I splurged on the Kate Somerville Dry Skin Saver) as it was the only thing that kept my flare-ups at bay. It is fragrance free and just provides the right level of hydration to my hands without being greasy. Also, if you are breastfeeding you will constantly be thirsty, so keep a bottle of water next to you as well as a lip balm - my favorite go-to are the ones from Fresh. This one in particular is the Sugar Lip Caramel Hydrating Balm. Just a bit of information on my current set up - I have a basinette set up in my bedroom, next to my bed in which baby sleeps in. I found that my paranoia came into play alot because I wouldn't know if I was overdressing or underdressing baby E. I didn't want him catching a cold, but I didn't want him to be sweating up a storm at the same time and I found that to be the case once or twice when I would pick him up for a feeding, his back was drenched. Next, hubby and I were looking for a sound machine to help with baby E when he went to sleep - we were looking at machines that sang lullabies, or had nature sounds - but then we came across the Dohm White Noise Machine. It adjusts in volume and sound level by twisting the top - but all it does is play white noises kind of like the sound of a fan? It is extremely soothing and both husband and I agree that it has even allowed us to sleep better. This is a great purchase! The first night we turned it on, he went from crying baby to instant slumber - it was hard to believe! Lastly, keep a notebook or in my case, an agenda next to you - You will never realize what ideas spring into your head during the most random of times - like, things you remember you need to buy or even using it to document moments like first bath times, or expenses or I found it useful in the beginning when I had to record when I took my Tylenol/Advil combo for my pain. I could not take it more than 4 hours at a time so sometimes if I could go without it, obviously I wouldn't take the pills but then there are times when I had to, and it's hard to remember when that time was if I didn't record it. I contemplated using an app but apps force you to set pre-scheduled times which again, won't work if you are not actually taking it every 4 hours, but on an as needed basis. 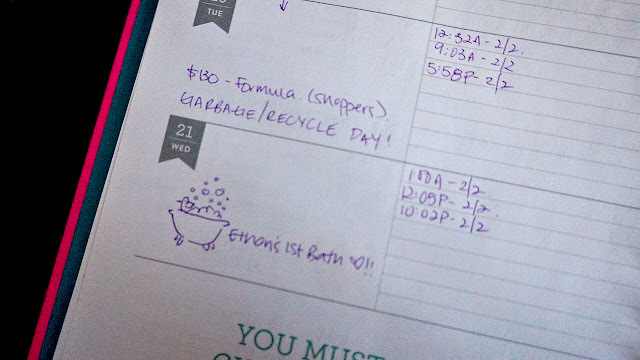 I hope this post helps you new mommies! I have more to come, and would love to hear any ideas on future blog posts from you!